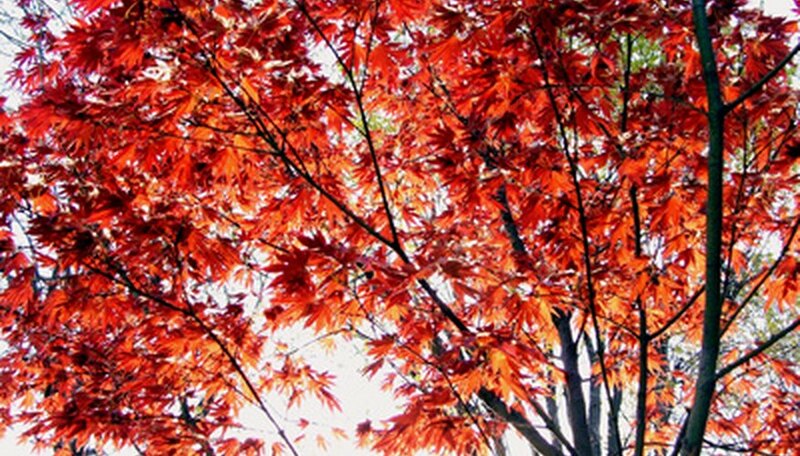 The red maple tree, or Acer rubrum, is a North American native with an oval shape and strong wood. This fast-growing tree can reach mature heights of up to 75 feet with a spread up to 35 feet. The red maple produces green foliage that changes to showy reds and oranges with fall’s onset. Its showy red flowers appear throughout the spring and winter months. Though this hardy tree is a vigorous grower, the red maple is susceptible to several tree diseases, some of which could be harmful. Anthracnose is a fungal disease that causes leaf blight of the red maple’s foliage. Though anthracnose infection of the red maple is not fatal to the tree, it does cause an unsightly appearance. Foliage of infected trees will show discolored veins, brownish leaf blotches and the appearance of fungal spores on the underside of the leaf. Untreated red maples may also experience severe defoliation. Anthracnose can be treated with fungicidal treatments. These treatments must be applied during bud break to avoid the spread of the disease from mature foliage to new growth. Fungicides containing chlorothalonil or mancozeb are most effective. Bacterial leaf scorch is a chronic disease that can have debilitating effects on the red maple if left untreated. The bacterium, spread by tree-hopping insects, infects the tissue of the tree. This infection interrupts the tree’s ability to pass water by clogging the xylem cells. This interruption prevents water from reaching the leaves, which results in leaf scorch. Red maple trees that are infected with bacterial leaf scorch show symptoms such as drying and curling of foliage, browning and yellowing of foliage, and early defoliation. Symptoms generally appear on older leaves first and then spread to younger leaves. Bacterial leaf scorch spreads progressively and worsens with each growing season. If left untreated, the red maple will begin to experience severe defoliation, which will result in the weakening and dieback of twigs and stems. The infection can be controlled with pruning when addressed early. There are currently no viable chemical treatments available for this disease. Crown gall is a soil-borne bacterial disease that can live two to three years in the soil without a host. This disease attacks the wood of the tree, usually through pruning cuts and insect wounds. Infected trees develop smooth, light-colored galls on its stems and roots. The developing galls will harden, become discolored and then decay. As the galls grow, the red maple will experience a loss in vigor, which will result in growth stunt and overall weakening. Chemical treatments for crown gall do not exist. Steps must be taken to avoid this soil-borne disease, which should include the proper removal and discarding of infected trees and the proper sanitation of tree implements. The planting of disease-resistant turf can help to eliminate the disease if left untouched for at least three years.